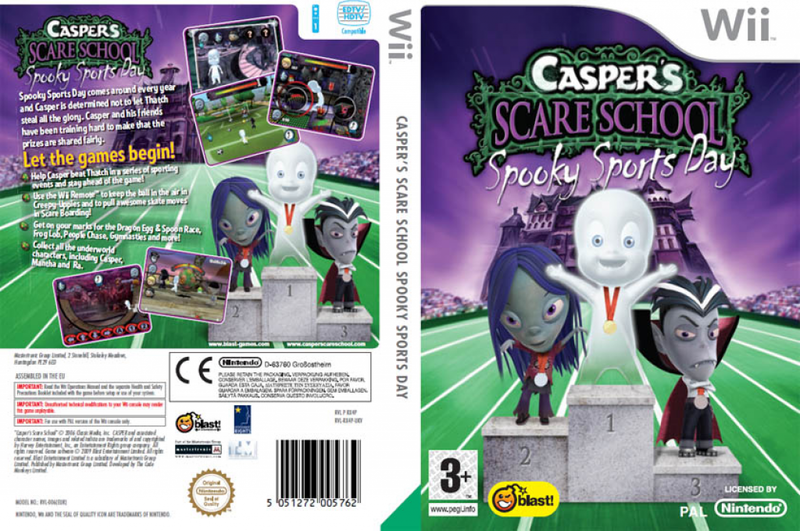 synopsis (EN) Spooky Sports Day comes around every year and Casper is determined not to let Thatch steal all the glory. Casper and his friends have been training hard to make that the prizes are shared fairly. * Help Casper beat Thatch in a series of sporting events and stay ahead of the game! * Use the Wii Remote™ to keep the ball in the air in Creepy-Uppies and to pull awesome skate moves in Scare Boarding! * Get on your marks for the Dragon Egg & Spoon Race, Frog Lob, People Chase, Gymnasties and more! synopsis (FR) Rejoignez Casper et ses amis et relevez de nombreux challenges délirants pour devenir le grand champion de l'Ecole de la Peur. Aidez Casper à décrocher la médaille d'or ou choisissez Mantha, Ra Jimmy et Thatch que vous pourrez également incarner. synopsis (DE) Auf ins Spiel! Die Bundesspukspiele finden einmal im Jahr statt, und diesmal ist Casper fest entschlossen, nicht wieder Thatch den ganzen Ruhm einheimsen zu lassen. Casper und seine Freunde haben hart trainiert, um sicherzustellen, dass die Preise in diesem Jahr besser verteitwerden! * Hilf Casper dabei, Thatch in einer Reihe von Sportveranstaltungen zu schlagen und die Nase im Spiel vorn zu haben! * Halte beim Spukball den Ball mit der Wii-Fernbedienung in der Luft und zeige beim Schreckboarding ein paar tolle Skate-Tricks! * Sammle sämtliche Unterwelt-Charaktere wieCasper, Mantha, Ra und Jimmy! synopsis (ES) Basado en la película de igual nombre aparecida en el año 2006, llega un videojuego destinado a los más pequeños. Casper se alía a sus compañeros de clase en pos del vampiro Thatch en una serie de minijuegos que mantendrán entretenidos a sus seguidores. synopsis (NL) Klaar voor de start, af! Spooky Sportdag wordt maar een keer per jaar gehouden en deze keer zal Casper er alles aan doen om te zorgen dat Thatch niet nog een keer wint. Casper en zijn vrienden hebben heel hard getraind zodat de prijzenz hopelijk dit jaar wat eerlijker worden verdeeld! * Zorg dat Casper eindelijk Thatch verslaat en een aantal overwinningen op zijn naam schrijft! * Gebruik de Wii-afstandsbediening om de bal in de lucht te houden in Stuiter-Stuiter en voer in Angstboarding een aantal flitsende moves met je Angstboard uit! * Verzamel alle personages als Casper, Mantha, Ra en Jimmy! synopsis (PT) É o grande Dia do Desporto no mundo dos fantasmas e há vários eventos desportivos empolgantes a decorrer nos recintos da Escola de Sustos. Junta-te ao Casper e aos seus amigos numa variedade de jogos divertidos e desafiantes e vê quem vai ser o campeão do desporto! - Desfruta de horas de acção contagiante nesta adaptação soberba do filme "Casper's Scare School" do Cartoon Network. - Compete numa série de modalidades desportivas para ajudares Casper a vencer a medalha de ouro e a manter-se na liderança! - Ajuda Casper e os seus amigos a evitar que a bola toque no chão em Creepy-Uppies e usa o ecrã táctil ou o botão direccional para controlares a bola quando ela estiver no ar. - Põe à prova a tua velocidade no jogo "Dragon Egg and Spoon Race" e vê com que rapidez consegues correr a transportar um enorme ovo de dragão numa colher minúscula! Usa o ecrã táctil ou o botão direccional para equilibrares o ovo. - Exibe a tua capacidade de corrida em "People Chase", mas tem cuidado para evitares os obstáculos monstruosos na pista de corrida! Grita "boo" para o microfone ou pressiona um dos botões superiores para assustares os "fleshies"! - Vence os concorrentes e desbloqueia a capacidade de jogar na pele dos teus adversários derrotados e colecciona todas as personagens do Submundo, incluindo Casper, Manthra, Ra, Jimmy e Thatch! synopsis (DK) Det er sportsdag i underverdenen og forskellige spændende sportsbegivenheder, finder sted omkring området på Scare School. Deltag sammen med Casper og hans venner i en række udfordrende og sjove spil og for at se hvem der bliver skolens sportsstjerne! • Experience hours of fun and absorbing gameplay in this superb adaptation of the Cartoon Network film Casper's Scare School. • Compete in a series of sporting events to help Casper win Gold and stay ahead of the game! 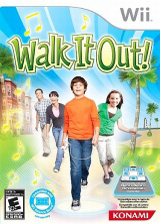 • Use the Wii Remote to control the gameplay! • Help Casper and his friends to keep the ball off the ground in Creepy - Uppies and use the Wii Remote to control the ball when it's up in the air. • Test your speed in Dragon Egg and Spoon Race game and see how fast you can run carrying an enormous Dragon's egg on a tiny spoon! Use the Wii Remote to balance the egg. • Show off your running prowess in People Chase! Jump in front of the 'fleshes' to scare them, but be careful to avoid monstrous obstacles on the race track! • Use the Wii Remote to perform scary tricks, such as Skull Tumble or Death Roll in the exciting game of Gymnasties! • Beat your competitors and unlock the ability to play as your defeated opponents and collect all the Underworld characters, including Casper, Manthra, Ra, Jimmy and Thatch! developer The Code Monkeys Limited. publisher Mastertronic Group Limited / Blast !